Enjoy the best Iberico and Serrano Ham Visit our shop! Serrano ham is usually eaten over a long period of time in small amounts, as a daily snack or for a treat, so a single ham can last many months. That means that if you're to get the most out of it, you need to know how to store your Serrano ham so that each slice delivers the full flavor and aroma. First, you must carefully follow the cutting directions, the most important of which is that you should only cut the ham you plan to eat immediately. Cut ham is far harder to store and preserve, so if you want to know how to store your Serrano ham, that's the first step to take. Once you've begun cutting into your ham, you need to treat the area where the cuts were made slightly differently,and there are things you can do to preserve leftover slices too. One effective method is to keep the first layer of skin and fat that you removed to get to the flesh of the Spanish ham, and replace it over the cutting area. It was once popular to impregnate the exposed surface with oil and paprika, but while this preserves the ham it alters the flavor, aroma and texture so it's less popular now than it was. The ham's own fat keeps the meat and the flavor. 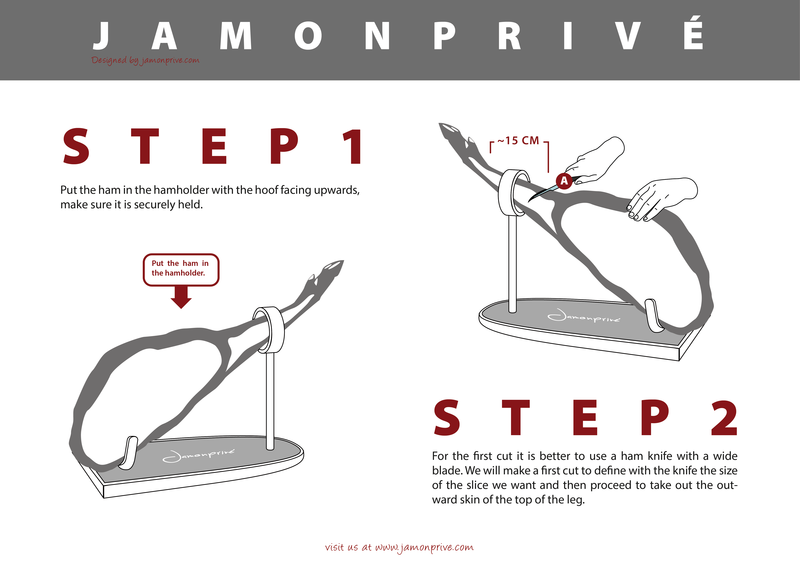 Another option is to cover the Spanish ham with a cloth or a woven sack and hang with the hoof facing upwards. For convenience, many people store their hams horizontally on ham holders or even shelves, but it's far better to let the fats flow with gravity if you can (this is the reason behind the little upside-down plastic umbrellas you sometimes see underneath hams). Covered in this way, and hung in a cool, dry atmosphere where the temperature is between 10 and 18 degrees Celsius (the ideal environment in a winery, incidentally), your Spanish ham will be in the best possible condition for you to enjoy its flavor. It's very important that you don't use plastic to wrap your ham, since it needs to be able to breathe or it will molder. If it's a long time between making cuts you should cut away the surface layer of your ham, which will tend to spoil if it's left too long, with the meat becoming hard while the fat acquires a rancid flavor. As we mentioned above, you should cut only the number of slices that you plan to eat that day. It's better to cut a few short and have to cut more than to have leftovers. Once cut away from the ham, slices will tend to harden in just a few days and go stale. There are ways to preserve leftover slices so that, while they will never have the flavor and mouth feel of fresh-cut ham they will remain in a more or less acceptable condition. If you have too many slices, you will need to store them on a refrigerator (though not without a plate). You should cover the Spanish ham in plastic wrap, making sure there is no air inside the plastic. You're trying to get as close to a vacuum as possible, to stop the molecules that give the ham its flavor from oxidizing. In fact, many people prefer to buy ham ready-sliced in vacuum packaging for convenience. In either case, it's important to remember that before eating them they should be exposed to the air at room temperature to recover as fully as possible their original organoleptic properties. Remember: store your Serrano ham in good condition to enjoy its unique flavor! What is the best para negra ham? Is the term pata negra correct? How can you know which ham to buy? Why is good ham so expensive? What to do with the ham bone? Why do we usually hang ham? Ham and Pregnancy: Can Iberian ham be included in pregnant women’s diets? 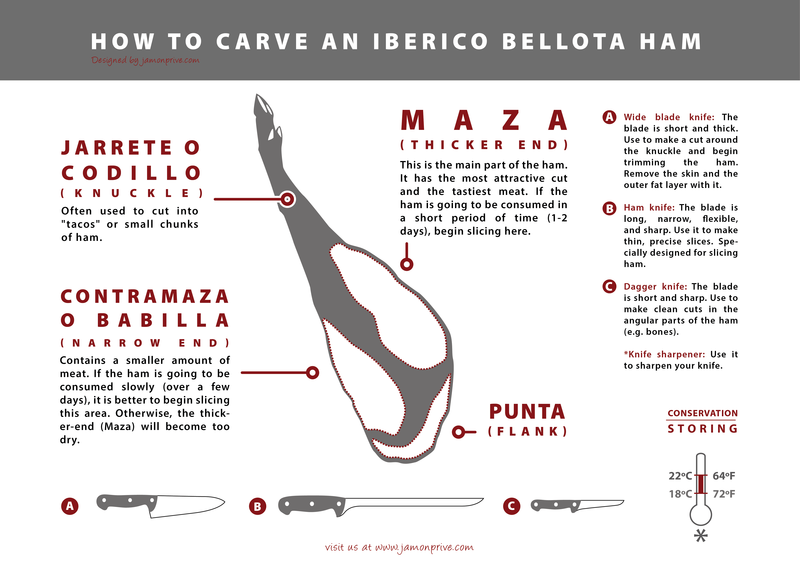 What is ham shaping and why is it done?